Clicky Needles: Happy New Year! Firstly I hope you a Happy and Peaceful New Year. My Christmas has been lovely, some family filled days and some days with just Mr Clicky and me. He arrived back from Chicago on the 21st December and he will be returning on 5th January and it's been great to have him home. As I mentioned in my last post I have been making things. 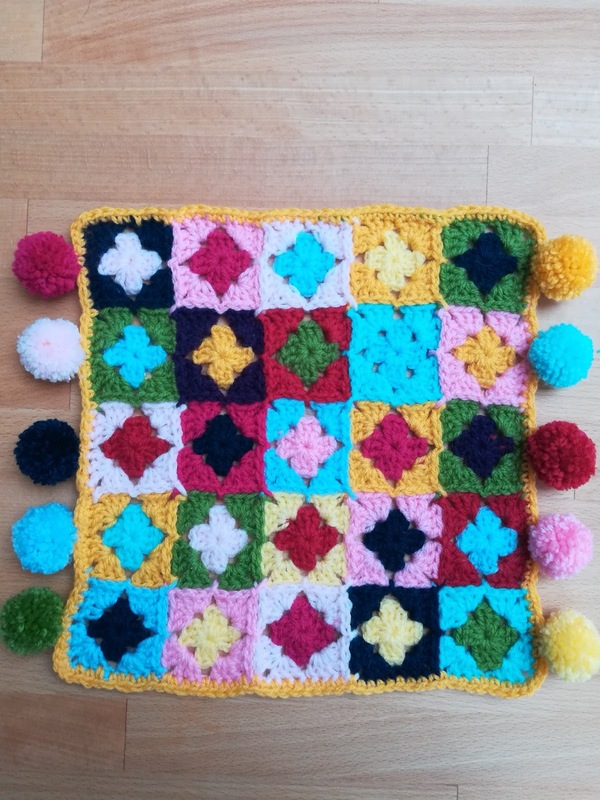 I got a call from a lovely old friend to ask if I would make a crochet blanket for her granddaughter's new pram, made by granddad. Of course I said yes and made a bright cheerful little 30cm square. I so enjoyed making this and I added some tiny pom-poms to the edges. 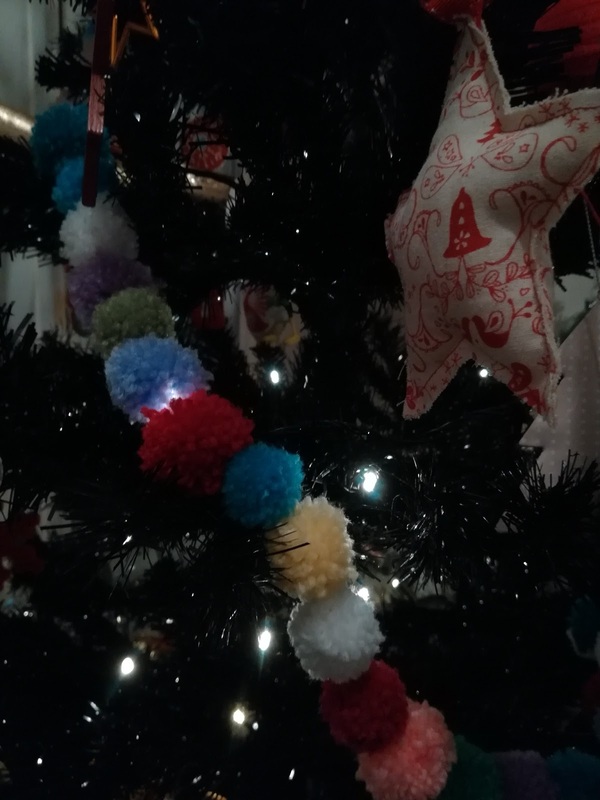 The pom-pom bug bit and I then made more, to decorate one (!) 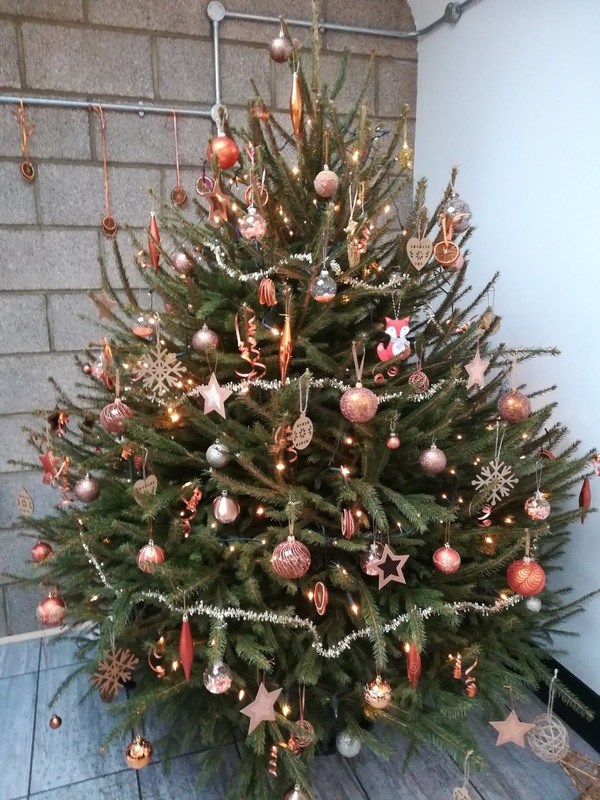 of my Christmas Trees. As I am no longer working and have more time I also made Christmas Cards. A chunky scarf for my friend's birthday on Boxing Day; made with some chunky yarn and some more pom-poms for good measure. 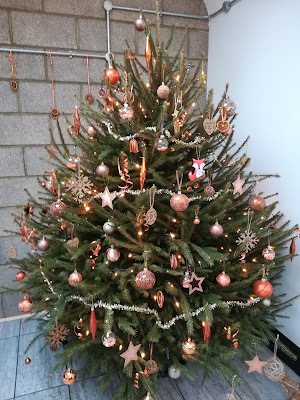 My (big) christmas tree this year had an orange/bronze tone. I used some wooden decorations from previous years and made some new ones, dried oranges, stuck star gift tags together and filled glass baubles with beads and foil paper I got from Amazon. 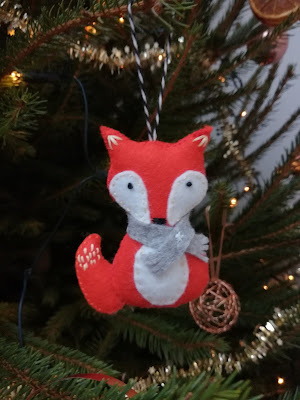 Can you see the little orange felt fox? I made him too, I love the way he looks all snuggled up in his scarf. The rest of this week Mr Clicky and me are doing a bit of work around the house, and sorting out some things for him to take back to Chicago. As always, have fun.............Clicky Needles. It all sounds so lovely and festive. Happy New Year! I'm glad your husband was able to come home for the holidays. I bet your kids were very happy to have him there again. I hope you have a wonderful new year.